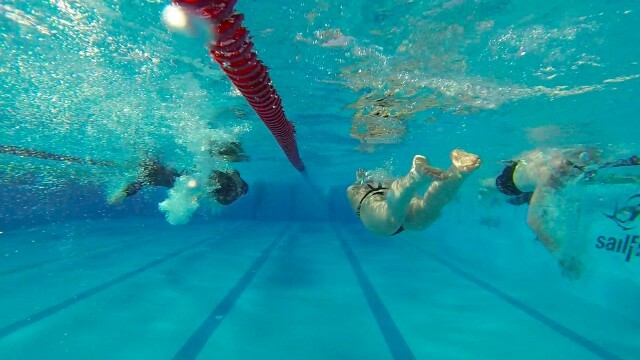 I started this blog an hour before the swim session and the fast group had only just returned. Recovery was minimal. The third day of riding was the biggest yet, 135 kilometres to the south of the island on a tight schedule: depart from Sands Beach at 8:30 promptly with the aim of finishing by 2pm. In the toughest winds so far this week 2pm proved optimistic, yet most athletes completed a full swim set. The fatigue was obvious at breakfast – few had slept well, disturbed either by the wind or tired legs, food was eaten out of necessity rather than desire. 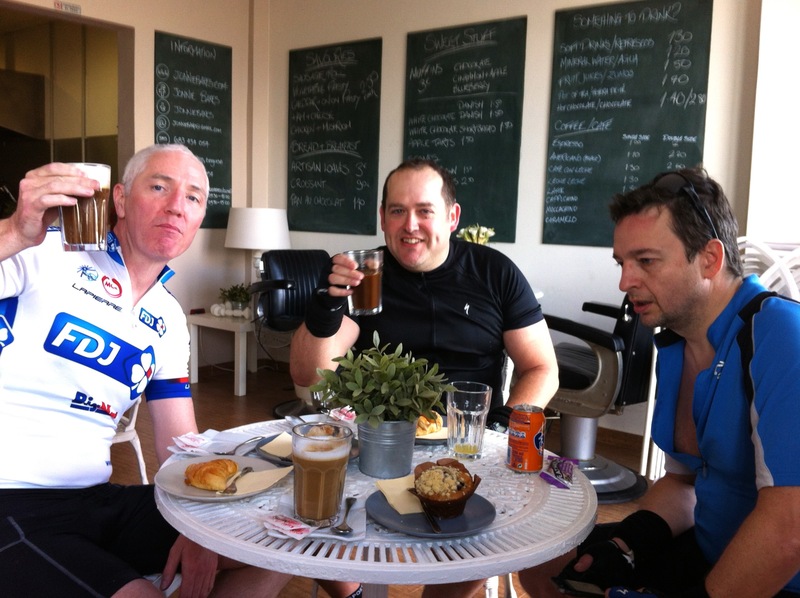 My steady group sensibly decided on a shorter cafe ride, sufficiently challenging in today’s conditions, but offering more chance for recovery in preparation for Thursday’s big ride. 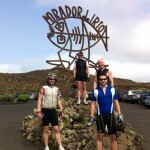 I’m pleased to hear that the fast group also opted for a coffee stop after battling the headwind out of Playa Blanca. They’d earned it with the work they’ve put in so far this week. But while my group was ready for another solid swim session from Mark, the faster boys were suffering. 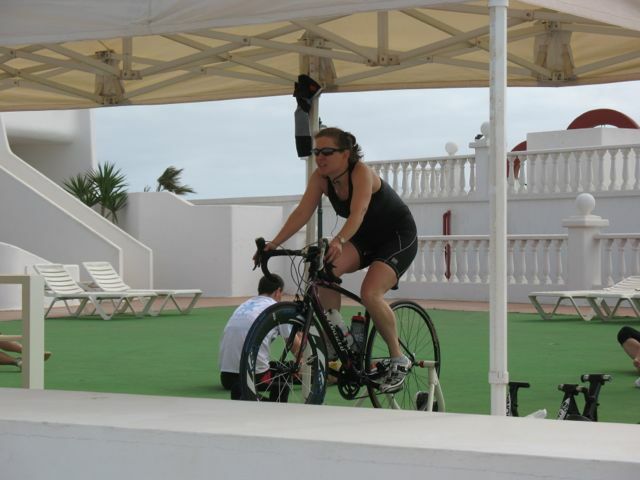 So far these reports have focussed on my steady group’s rides, with little said about the work Donna is putting in back at Sands Beach Resort. Every day we’ve been riding so has she, confined to the turbo by knee injuries she does what she can to make the most of the training camp. Particularly during the swim sessions. A redistribution of wetsuits ensured that most athletes were able to complete a full 90 minutes in the pool with only a couple succumbing to cold or cramps. Despite the rides in their legs with Mark and I shouting from the deck they pushed themselves through another big set and I’m pleased to see the swim/bike focus working well. I’ve been busy collecting hours of swim video to assemble on return from the camp and tomorrow we’ll spend the afternoon giving individual filming and technique coaching as well. Bike and swim volume is far higher than normal this week. We did run as well. In fact I was surprised at the enthusiasm for a run after the 6.5 hours of training many had done. Our easy run led into the hills around Costa Teguise and once again – somehow – we ended up further off road than planned. I enjoy this kind of trail running, but didn’t really want the risk of injury that comes with it. Still, it was completed without incident and rounded out a 7 hour day for some. The day finished with a trip to the bar after dinner. So the blog is even later tonight as this coach led by example, but then I don’t have the prospect of a 9am brick session looming over me. Tomorrow is the easy day, for me one of rest as I support training and film swimming, for the athletes there is just that short brick sessions and a swim set to worry about before they face the full Ironman course on Thursday.